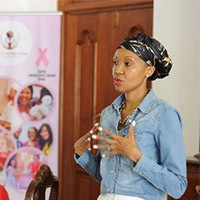 Phungi is TMZ Foundation’s Goodwill Ambassador & Advocate for breast cancer. She’s also a breast cancer survivor/warrior herself, having fought and conquered the disease over five years ago. At that time, patients underwent surgery not knowing if they would have a breast when they woke up, as mastectomies were the only option available at that time. She was lucky. One in 28 women in South Africa are diagnosed with breast cancer. As disturbing as it is to see so many women diagnosed with the disease, Phungi now knows that the landscape is changing and there is much hope on the horizon. Thanks to improved screening, treatment and support, Phungi believes breast cancer can be overcome, but only if detected early. Options unheard of when she was diagnosed over 5 years ago, are now standard tools in the cancer fighting arsenal. Treatment remains life altering, but today we have new tools and an ever-widening array of genetic markers to detect quickly and accurately. Phungi recognizes that the many advances in breast cancer detection and treatment are directly linked to research, education and advocacy, championed by non-profit organisations such as the TMZ Foundation and South Africa’s Department of Health. Their combined commitments has extended life and inspired hope for countless women. “Early detection and improved treatment does save lives but, please, let that cure be soon. I do not want my nieces and daughters to undergo what I did.” Phungi explained. Phungi’s story has a happy ending. She and husband Brian have been blessed with a healthy baby boy. She fell pregnant after her breast cancer went into remission.